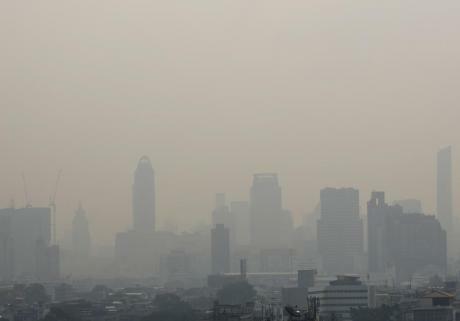 Bangkok has been hit by a thick smog so bad that residents have been coughing and sneezing up blood. The city’s pollution problem has got to such a state that even pets are suffering from illnesses caused by the smog. A thick cloud of toxic smog made up of dangerous PM2.5 particles has become lodged in people’s lungs and blanketed the Thai capital for the last fortnight. Experts have warned that the long term cost of the pollution caused by vehicles, construction projects, burning crops and street food BBQs could run into tens of millions of dollars. 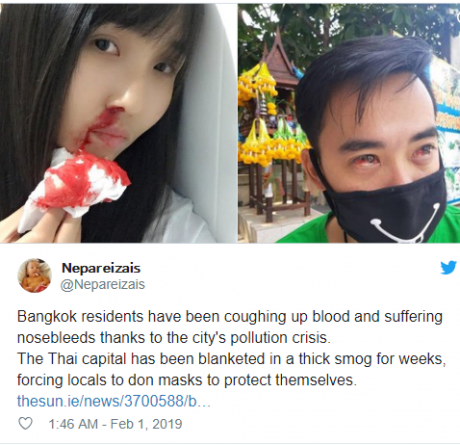 But as pictures posted on social media by citizens show, residents and animals have already been badly affected – sneezing and coughing blood into their face masks.